Leading Poker Table, Poker Chips & Accessories Distributor! 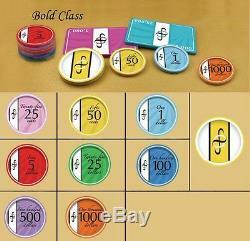 Set includes: 500 x 10g Bold Class Design Ceramic Poker Chips Special Bold Class Design Dealer Button. Material: Ceramic Diameter: 39.5 mm Thickness: 3.3 mm Weight: 10 gram/pc Both Sides of the Chip are printed with the beautiful Bold Class design, and you can choose from the colours/ denominations below to make up your set with a Min of 25pce per Colour. The print is done via direct dye sublimination. No stickers are used, and this eliminates wear and fading of the print work. International Buyers: If purchasing from outside Australia, the rates should also be highlighted at the top of the page, or you can contact me to confirm. Claims for transport damage must be made within 48 hours after receiving goods. Note: You should never sign for the item (or sign and write STC subject to check) if you see any noticeable damage upon receiving the item. ACC NAME: Iconic Poker Supplies. If you are picking up the item you can pay Cash, or alternatively make the direct deposit before picking up. Does not cover any physical damage, accidents or misuse of the product. "Iconic Poker Supplies" is a long term supplier for Poker Leagues, Pubs, Clubs, Organisations and Individuals. ABN # 51 370 726 178. Contact Ken - Ph: 0419 771 230. The item "BOLD CLASS 500pc 10g CERAMIC POKER CHIP SET CUSTOM MADE" is in sale since Saturday, July 20, 2013. This item is in the category "Toys, Hobbies\Games\Card Games & Poker\Card Games-Contemporary". The seller is "iconicauctions" and is located in Clifton Springs. This item can be shipped worldwide.